One thing I need to do at work is run a lot of virtual machines, so when I got the MacBook, one of the first programs I got was VMware Fusion. There are other virtualization software available for OS X, but I've been a long time user of VMware Workstation in Windows, so I decided to get Fusion. Unfortunately, according to Intel, the new Intel Core 2 Duo P7350 CPU is one of those cheaper ones that doesn't support Intel VT-x. VT-x is vital to me because I need to run 64-bit guest OS's. In fact, when I bought the ThinkPad T60 two years ago, I paid extra to get the T5600 CPU that has VT-x enabled when the standard CPU at the time was the much cheaper T5500. However, when I looked at the CPU features inside Terminal, it does show me VMX as available. 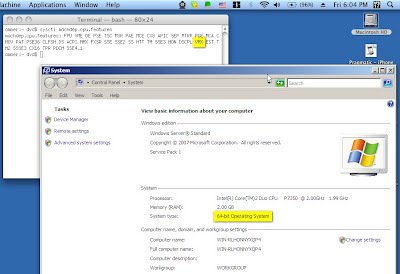 Update (and warning): I did a bit more research on this, and it appears that normally the P7350 does not have VT-x. In fact, Intel at one time had a misprint on the spec sheet that showed it as having VT-x enabled. It's entirely possible that Apple is using a special P7350 part for the MacBook, and it may or may not change in the future. I'm glad it worked out for me, but YMMV. And yes, I should have done research on the P7350 before I bought the MacBook, but all the ThinkPads I've been buying recently have VT-x, and I didn't think a "P" Core 2 Duo and an Apple product could have a missing feature. Sweet man, I thought I'd have to save up for the higher-tier unibody macbook just to get hardware support for virtualization. Good to know the P7350 in the white and base unibody macbooks has that, too. It's certainly possible to disable VT-x in a BIOS upgrade. My old ThinkPad Z61t (and I heard some HP's too) got a BIOS upgrade that enabled VT-x a few months after its release. I do have all updates (10.5.7) installed as of this writing, and I run Windows Server 2008 R2 in vmware everyday. "It's entirely possible that Apple is using a special P7350 part for the MacBook"
Which it is, I think. I have Toshiba satellite M300 with CORE 2 DUO P7350.Indeed, my laptop is not able to run virtual machine which has 64 bit Operating Systems. Therefore, I am looking a workaround how I can enable VT-X from my BIOS. your advise would be greatly appreciated.